With 2014 being two weeks old already, I have found some surprises when conducting an MLS listings search. We monitor all of the houses for sale in Tallahassee, and with a rebounding housing market, we had anticipated higher asking prices and more sellers streaming into the market. Today we reveal two real estate graphs that show everything is not going as expected thus far in 2014. In previous articles, we have identified that there are thousands of homes remaining in the shadow inventory; home sellers who want to sell their home but for some reason (most likely a lack of equity) cannot put their homes up for sale. With home values on the rise in Tallahassee, our logical conclusion is that we would see a growth in the stream of homes entering the market, and this had been for much of 2013. But things seem to have changed a month ago. 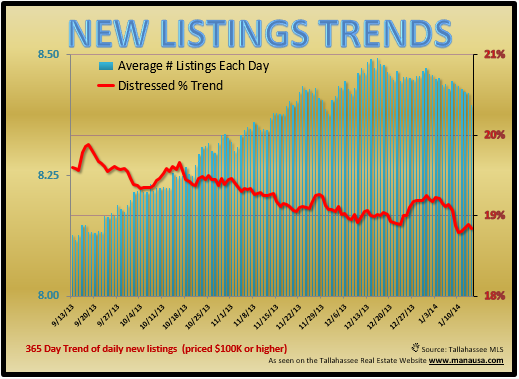 The graph above measures the 365 day trend of daily new listings coming onto the market (priced above $100,000). The blue bars measure the average number of homes listed each day, while the red line shows the percentage of these homes that are being marketed as "distressed." Again, this is a one-year trend, so none of the changes that we see are due to real estate seasonality. Every single point of information in the graph includes 365 days worth of data. Since September, we have seen new distressed home listings decline by roughly 4%, bringing the ratio below 19% for the first time in many years. Additionally, we have seen the number of homes listed increase almost 5%, but the last month has shown this annual average decline. So we can see that fewer homes will be found when doing an MLS listings search, but there is another surprise to report as well. The green shaded area in the real estate graph above shows that the average asking price for homes priced above $100,000 is on the decline. In fact, this average has fallen 1.6% (roughly a 6% annualized rate). Again, this is a 365 day trend, so we are not seeing any time-of-year issues having an impact on our results. The internet has really changed the way we sell a home and understanding how the Tallahassee MLS works in support of the internet marketing of a home is vital to a home seller's success. There are small subtle aspects of how we our tools to help home sellers get top dollar for their home, and I can assure you that it really does matter who you hire if your bottom line matters to you. 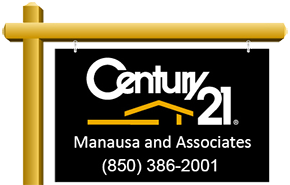 If you are thinking about selling a home in Tallahassee and want to know how to best appear in an MLS listings search, please drop me a note and we can schedule a time to show you how it is done.